It has been a while since I’ve reviewed a web comic. I’ve mentioned internet phenom Linkara more than once. The comic reviewer for That Guy With The Glasses and his own Atop the Fourth Wall is also a comic writer. He has two webcomics, a running series at Comic Genesis and the subject of tonight’s Showcase, Revolution of the Mask. Currently there are two issues of this series, and tonight I’m going to review them both. Obviously, I can’t host them here, but the distributor, Brain Scan Studios, has them available to download for a small fee. While the Wowio price is the most expensive (although still under a dollar), it also has them available to read free online, supported by advertisements. It is through here that I was able to read them, but you should go with the way you think best. Either way, take a look, and hit the “read more” line to see my thoughts. She’s in, and he’s in love! 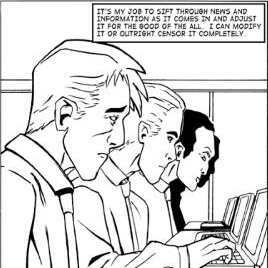 Our gateway into the world of “the All” is Gamma-117, a “censor” who sifts through news stories deciding what to keep out of the reports the average person sees. However, he seems to be questioning this world, which is against the rules as it is. Enter Eighth Wonder, a superheroine and leader of a group who found comic books in an abandoned city and decided that individuality and personal freedom have their advantages. Much like the “real life superheroes” popping up in the real world, only a lot more proactive than “civil activists with a gimmick” (my terms, and I support the program). These superheroes are motivated to fight back against the All, and plead with the people to become something better. So the media never really changes, then? In an interview with the Podcast Made of Fail, Lovhaug described his vision for the comic, the extreme end of ending the class system and the phrases “the needs of the many outweigh the needs of the few” and “everything not forbidden is compulsory”. Conformity is the law, but here come people in capes and masks who are trying to not only secure their individuality but awaken the world to their own. This alone peeks my interest, and I wasn’t disappointed. The story in the two issues are rather well written. 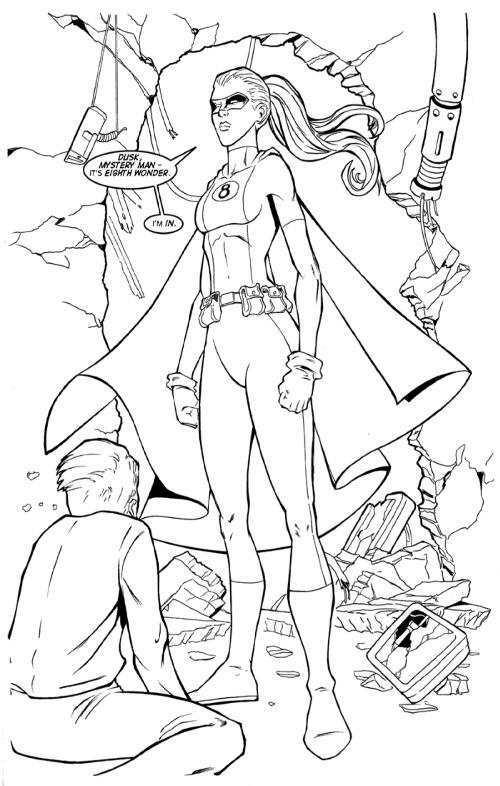 While two of the heroes aren’t given a name (well, the other heroine in the story gets the “normal” name Jenny, but no super hero name is given), we do meet the aforementioned “Eighth Wonder” and her comrades, Mystery Man (a name I wanted to use for a character someday 😦 ), Dusk, and Templar in the second issue. Some of the costume designs (as one reviewer noted) can be traced back to characters in other comics, but that actually makes sense. Originality is something new to these people. Hatred leads to anger. Anger leads to…no, that’s something else. In the second issue, we find out that the heroes live like normal people (just with costumes and armor). “Jenny” has the hots for Templar, the unnamed guy in the awesome suit isn’t happy with Eighth Wonder’s methods. Both could be important to fleshing out the characters. Then there’s Gamma-117. His eyes have been opened to a new way of thinking, as have been a number of others. Lovhaug sets up a lot of potential, and I hope he lives up to all of it. Frietes’s artwork is also well done. From the backgrounds to the characters, you are easily drawn into the world of Revolution. Gamma-117 plugs into the computers like in The Matrix, there are propaganda signs everywhere (even in people’s homes), and debauchery is still everywhere. You can refuse nothing asked of you because you no longer belong to yourself. You belong to “the All”, and everything reminds you of it. Contrast to the abandoned city the heroes live in. It’s hardly the “utopia” of the other city. On the other hand, it does come off as a headquarters for superheroes, and what technology they have were based on what they could smuggle away from their time as part of the All’s work teams. Again, the costume designs reflect people just beginning to grasp the superhero concept. Who knows what original ideas would come from future generations. There is however one oddity. You know the images you’ve been seeing all over this article? Well, for some reason one page in the first issue comes out a bit different. It’s a great sequence, but it looks like the image was in color (like the covers), and then turned into a black-and-white image. Otherwise, the art is the same as the rest of the comic, but this does distract for a brief moment. All and all a great couple of comics. I hope Lovhaug and Frietes come back for more issues. For under a dollar, it’s probably better than the $3-4 you pay for regular comics. Posted by ShadowWing Tronix on October 24, 2009 in Comic Spotlight, Internet Spotlight, Saturday Night Showcase and tagged Atop The Fourth Wall, Brain Scan Comics, Linkara, Revolution of the Mask, webcomic.